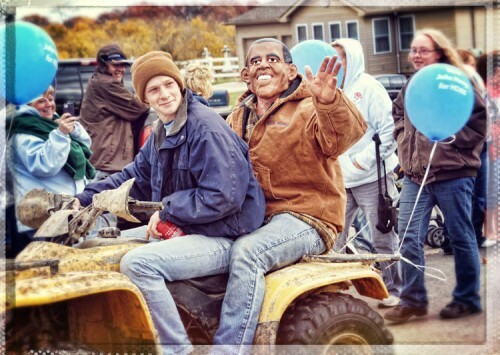 I especially enjoyed the parade this year, which included some old tractors, old cars and trucks, the East Central High School band, the old steam engine tractor that pulls the pole through town, and a surprise visit from President Obama!!! President Obama made a surprise showing in the parade! I should say, the “new” American Sign Museum. Just recently moved into this larger space, they are better suited to grow and also to host special events. Several years ago I did a couple panos from the old space and I thought it would be appropriate to get a more comprehensive tour of the beautiful facility that they now have. This is a larger tour with 11 panoramic views and a few detail shots mixed in for good measure. I kept the panoramas at a higher resolution so that it is possible to zoom in bit to see more detail. This could cause the views to take a little longer to load depending on the connection speed you have. This is a very colorful place with lots of things to look at no matter which way you are facing. The Stone Arch Bridge is the only bridge of it’s kind along the Mississippi River. Having 23 arches, it is 2100 feet long and contains 100,000 tons of limestone and granite. It was built by railroad baron James J. Hill and completed in 1883. It was originally used as a railroad bridge and carried as many as 48 passenger trains into Minneapolis everyday. Now it is part of the St. Anthony Falls Heritage Trail and used as a walking and bike path. It is significant historical landmark that forms an integral part of the redeveloped Minneapolis Riverfront. The bridge is just below St. Anthony Falls which is the birthplace of Minneapolis and was the only true waterfall on the Mississippi River. Cincinnati was one of 146 different US cities to host a rally to protest the Obama administration mandate forcing religious universities, charities, and other groups to pay for abortifacient drugs and other birth control for students and employees. During a whirlwind 2 hours in downtown Chi-town, I managed to grab a couple of pano views including Pioneer Court and the much maligned and vandalized Marilyn Monroe statue. This panorama features the Great American Ballpark, home to the Cincinnati Reds baseball team and the Great American Tower building, I guess Cincinnati is a Great American city! Also, the US Bank Arena can be seen. Fausto has been working in his downtown Cincinnati, Ohio shop since 1957. I thought it was interesting that there were still banners from his 50th anniversary year in 2007, 4 years ago. He is also an accomplished musician with skills in playing the accordion, mandolin, guitar and clarinet. He is rather comfortable in front of the camera as over the years numerous newspaper and TV stories have featured him and his shop. 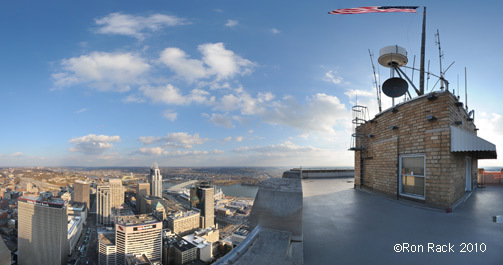 I was recently inspired to produce a “tower pano” from the top of the Carew Tower in Cincinnati. The Carew Tower is the only skyscraper in Cincinnati that has an observation deck that is open to the public. The deck is actually on the top of the building with unobstructed views in all directions. Most 360around panos are taken from one viewpoint, this one was from 8 different viewpoints on the observation deck. The most effective “tower panos” are taken on buildings with straight sides so that there is a view straight down to the ground. The end result appears that you are floating high above the building when viewing the pano. The Carew Tower has numerous set backs so that there is no view straight to the ground with the resulting view appearing not quite so high above the building. Another issue is the close proximity of other tall buildings close to the Carew Tower. The creates serious parallax problems when stitching together the images from the different viewpoints, in fact this was one of the more laborious panos I have created necessitating various retouching techniques to get it all to come together. It was a nice creative and technical challenge and I feel that the end result was worth the effort. This post features the Corbett Theater, the “crowning jewel” of the new center. It is the home of the School for the Creative and Performing Arts and Schiel Primary School for Arts Enrichment. It provides K-12 education in the arts and maintains high academic standards as well. I got a few panos while on a quick trip through Cleveland. Here is the Cuyahoga County Soldiers’ and Sailors’ Monument and E 4th St area. Here are a few panos from the opening day parade and fans going into the Great American Ball Park. 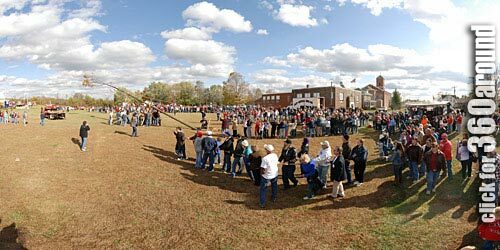 It was a most beautiful day which brought out a record crowd to view the parade with estimates of around 100,000 people lining the streets. You couldn’t go wrong by wearing red since both the Cincinnati Reds and their opponent, the St Louis Cardinals have red as their color. The Contemporary Arts Center in Cincinnati is hosting a retrospective exhibit of famed street artist Shepard Fairey during the spring and summer of 2010. Along with the exhibit inside the CAC, Mr. Fairey placed several murals in various locations around town. Go here to see panos of those murals in context of their environment . 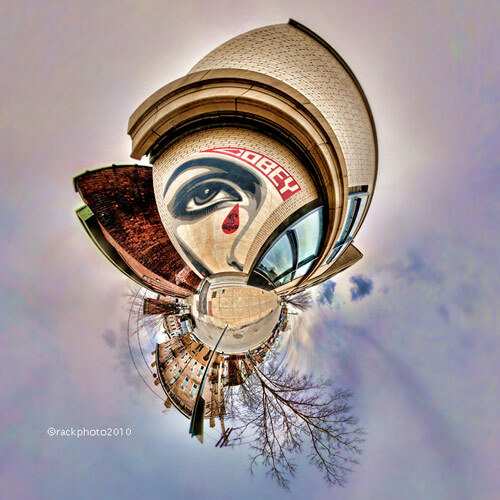 A couple of these locations also made for interesting Little Planet projections, see those here. 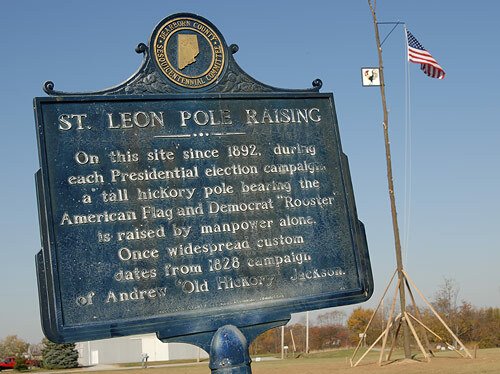 Every 4 years, on the 2nd Saturday before the presidential election, the community of St. Leon, Indiana continues the tradition of the Pole Raising to commemorate the presidency of Andrew “Old Hickory” Jackson. 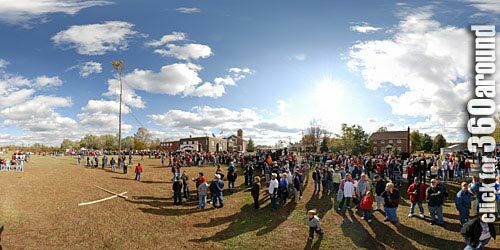 Once a common occurrence, St. Leon is believed to be the only place where you can see the pole raising today. The locals head to the woods in the morning to cut down a tall hickory tree. Then drag it back to town for a short parade featuring a steam powered tractor hauling the tree behind. Next some political speeches and rallying followed by the raising. Interesting side note to the sign picture above. 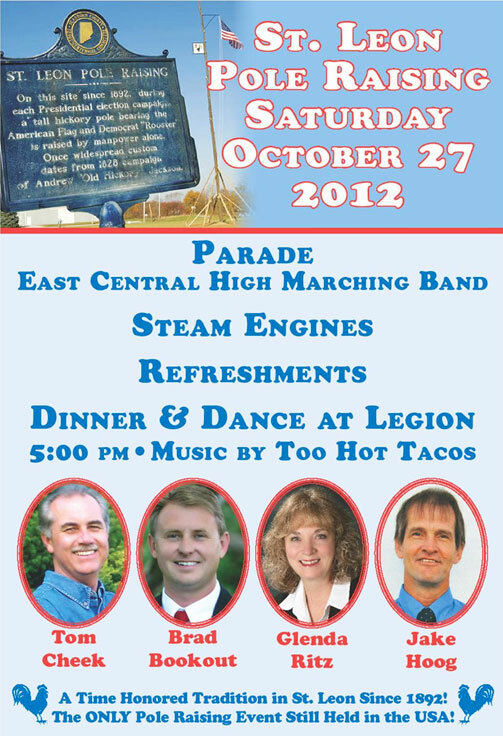 It appears that the Dearborn County Democrat Party liked this picture so much they decided to put it on their poster for the 2012 Pole Raising.